Description: Aqua spatula with an oval-shaped handle. The handle has a large raised "Fisher-Price" imprint in the middle, and a hole on the end of the handle. The spatula head has 3 long narrow oblong indentions on top and 2 square outlines on back. Back of handle is marked, "KOREA ©1987 FISHER-PRICE". Measures 5-3/4" long x 1-7/8" wide. 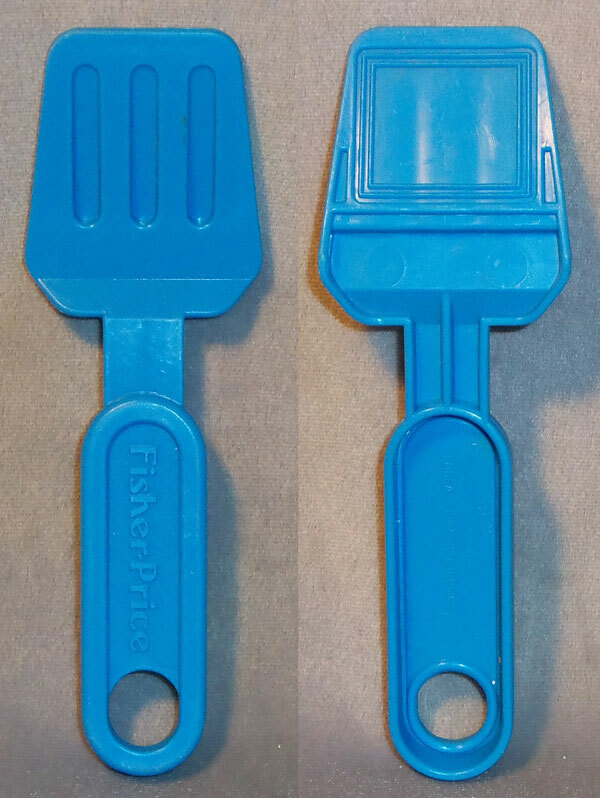 Description: Blue plastic spatula with a handle that has a large hole on the end. The handle has an apple imprint below the hole. The spatula head has 3 oblong indentions. Description: Blue spatula with an oval-shaped handle. 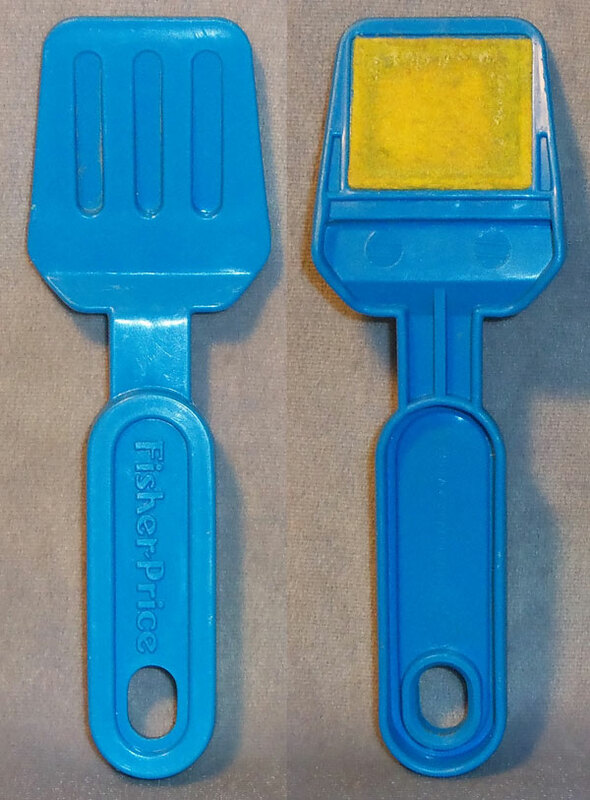 The handle has a large raised "Fisher-Price" imprint in the middle, and a hole on the end of the handle. The spatula head has 3 long narrow oblong indentions on top and 2 square outlines on back. Back of handle is marked, "KOREA ©1987 FISHER-PRICE". Measures 5-3/4" long x 1-7/8" wide. Description: Blue spatula with an oval-shaped handle. 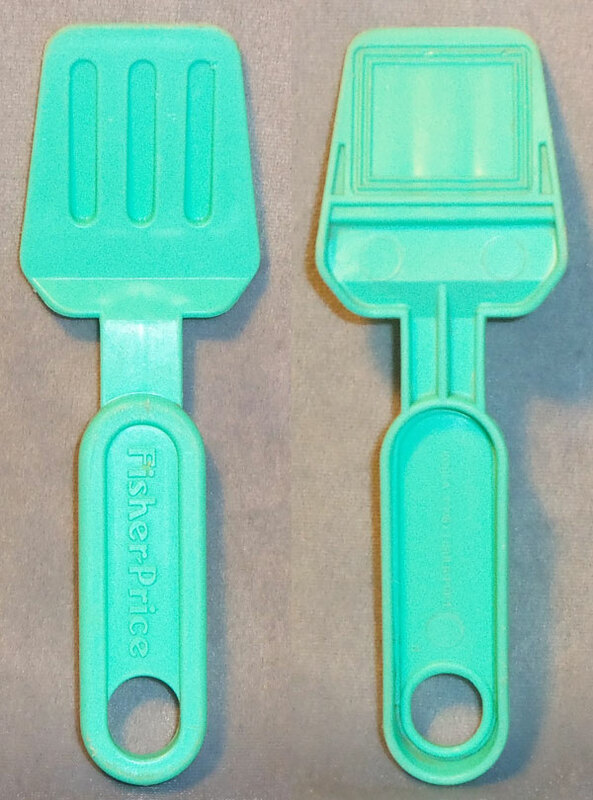 The handle has a large raised "Fisher-Price" imprint in the middle, and a hole on the end of the handle. The spatula head has 3 long narrow oblong indentions on top and YELLOW CLOTH on back. Back of handle is marked, "KOREA ©1987 FISHER-PRICE". Measures 5-3/4" long x 1-7/8" wide. Description: Blue spatula with a thin spatula head, used to "spread" cake frosting. The handle is oval-shaped with a raised "Fisher-Price" imprint in the middle and an oval-shaped hole on the end of the handle. Back of handle is marked, "©1987 FISHER-PRICE". Measures 5-3/4" long x 1-3/8" wide. 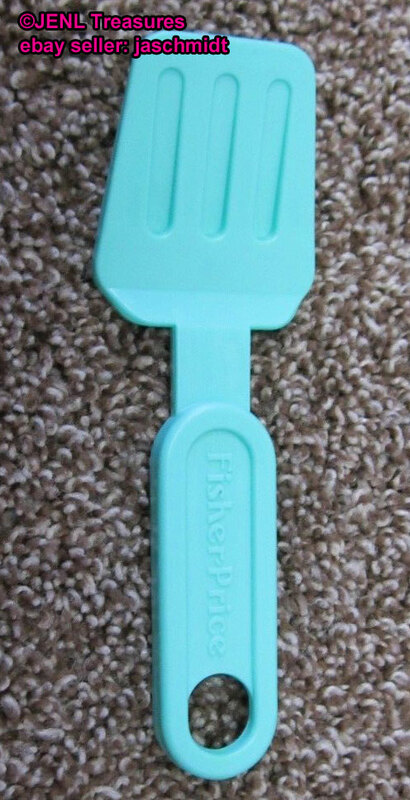 Description: Light blue spatula with a thin spatula head, used to "spread" cake frosting. The handle is oval-shaped with a raised "Fisher-Price" imprint in the middle and an oval-shaped hole on the end of the handle. Back of handle is marked, "©1987 FISHER-PRICE". Measures 5-3/4" long x 1-3/8" wide. Description: Light blue spatula with an oval-shaped handle. The handle has a large raised "Fisher-Price" imprint in the middle, and a hole on the end of the handle. The spatula head has 3 long narrow oblong indentions on top and 2 square outlines on back. Back of handle is marked, "KOREA ©1987 FISHER-PRICE". Measures 5-3/4" long x 1-7/8" wide. 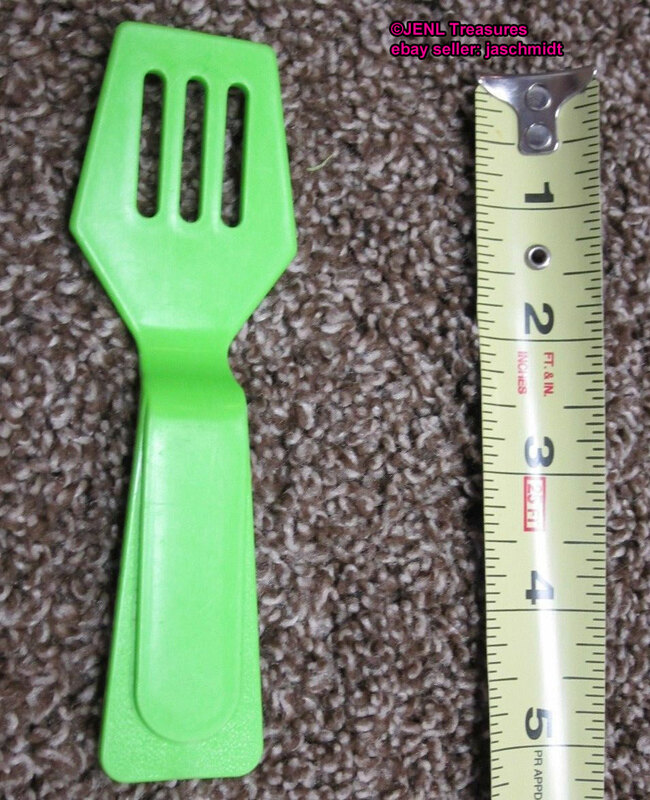 Description: Small green spatula with a handle that is wider at the end than the top. The end of the handle is squared. The spatula head has 3 long narrow oblong indentions. 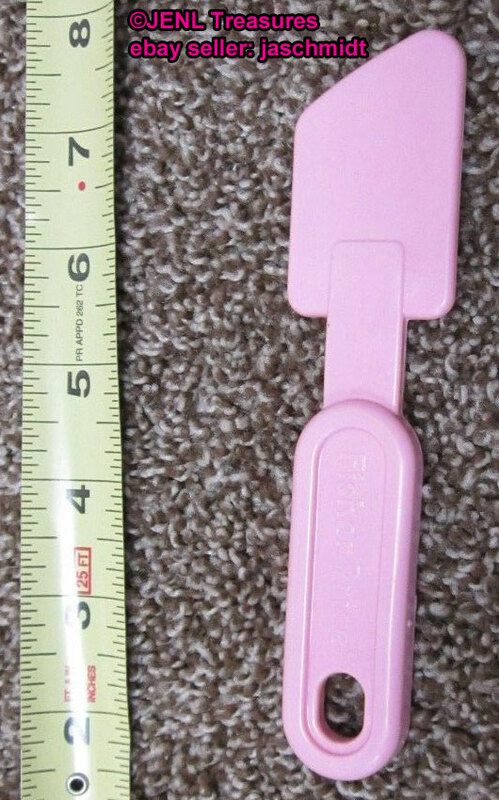 Description: Pink spatula with a thin spatula head, used to "spread" cake frosting. The handle is oval-shaped with a raised "Fisher-Price" imprint in the middle and an oval-shaped hole on the end of the handle. Back of handle is marked, "©1987 FISHER-PRICE". Measures 5-3/4" long x 1-3/8" wide. 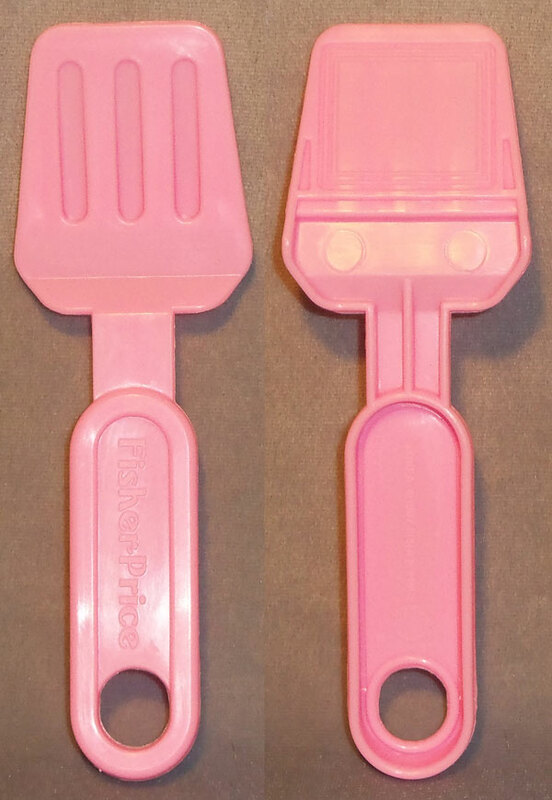 Description: Pink spatula with an oval-shaped handle. 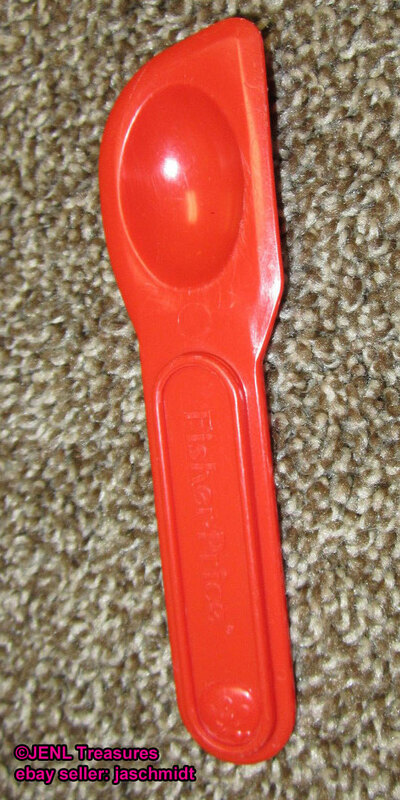 The handle has a large raised "Fisher-Price" imprint in the middle, and a hole on the end of the handle. The spatula head has 3 long narrow oblong indentions on top and 2 square outlines on back. Back of handle is marked, "KOREA ©1987 FISHER-PRICE". Measures 5-3/4" long x 1-7/8" wide. 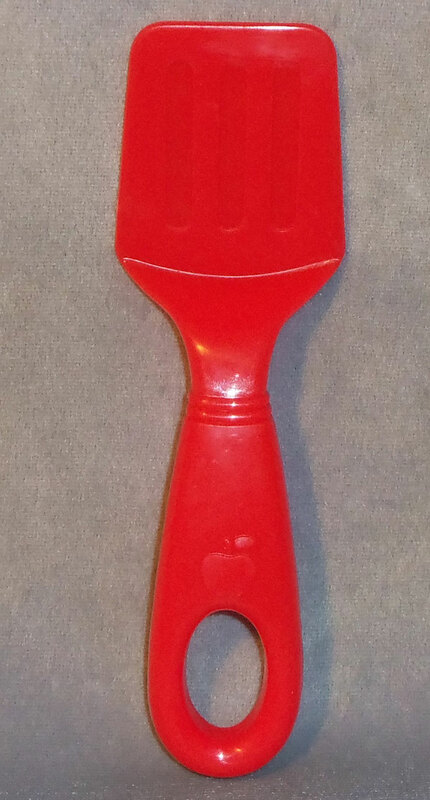 Description: Red spatula with an oval-shaped handle. The handle has a large raised "Fisher-Price" imprint in the middle, and a hole on the end of the handle. The spatula head has 3 long narrow oblong indentions on top and 2 square outlines on back. Back of handle is marked, "KOREA ©1987 FISHER-PRICE". Measures 5-3/4" long x 1-7/8" wide. 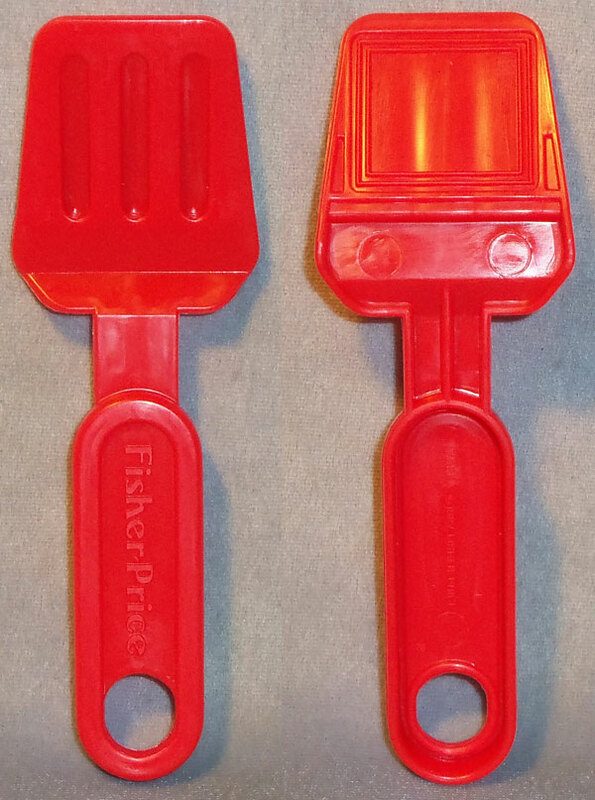 Description: Red spatula with a long handle that is bigger on the end than at the neck of the handle. There is a large oval-shaped hole in the end of the handle and an APPLE imprint under the hole. There are 2 raised rings around the neck of the handle. The spatula head has 3 oblong indentions. Back of handle is marked, "©'97 F-P, INC., CHINA". Measures 6" long x 1-7/8" wide. Description: Small yellow spatula with a handle that is wider at the end than the top. The end of the handle is squared. The spatula head has 3 long narrow oblong holes. Back of handle is marked, "F-P TOYS". Description: Yellow spatula with an oval-shaped handle. The handle has a large raised "Fisher-Price" imprint in the middle, and a hole on the end of the handle. The spatula head has 3 long narrow oblong indentions on top and 2 square outlines on back. Back of handle is marked, "KOREA ©1987 FISHER-PRICE". Measures 5-3/4" long x 1-7/8" wide. Description: Yellow spatula with an oval-shaped handle. The handle has a large raised "Fisher-Price" imprint in the middle, and a hole on the end of the handle. The spatula head has 3 long narrow oblong indentions on top and YELLOW CLOTH on back. Back of handle is marked, "KOREA ©1987 FISHER-PRICE". Measures 5-3/4" long x 1-7/8" wide. Description: Yellow spatula with a thin spatula head, used to "spread" cake frosting. The handle is oval-shaped with a raised "Fisher-Price" imprint in the middle and an oval-shaped hole on the end of the handle. Back of handle is marked, "©1987 FISHER-PRICE". Measures 5-3/4" long x 1-3/8" wide. Description: Yellow plastic spatula with a handle that has a large hole on the end. The handle has an apple imprint below the hole. The spatula head has 3 oblong indentions.